The placenta is an essential part of pregnancy and has to be delivered after you’ve given birth, but how much do you really know about it? It’s normal to have questions about the placenta, so here we explore all you need to know about this organ and what happens to it after you’ve had your baby. The placenta is an important organ that links you and your baby whilst you’re pregnant. The placenta is attached to the uterus and plays an important role throughout pregnancy, ensuring your baby is provided with enough essential nutrients and oxygen to keep them healthy and producing hormones which help them grow. Nutrients and oxygen are passed from your blood supply, to your baby, via the placenta and your baby is linked to the placenta through its umbilical cord. The placenta also acts as a form of protection, helping to protect unborn babies from many forms of bacteria. It doesn’t offer protection against viruses though, which is why viruses such as rubella can still harm an unborn baby. If you take certain forms of medication when pregnant, smoke nicotine cigarettes or drink alcohol, then the effects of these substances can also pass through the placenta and to your baby. When you’re coming to the end of your pregnancy, it’s the placenta that also helps pass on any antibodies that you have to your baby, which helps give them some forms of immunity for up to three months. What Does The Placenta Look Like? By the time your baby is ready to be born, the placenta will be a large, disc shape measuring about 15m to 22cm in diameter. It will be about 2cm to 4cm thick, have a smooth and shiny surface and be bluey red in colour. A placenta typically weighs about 400g to 600g. What Happens to the Placenta at Birth? After your baby has been born, the placenta has to be delivered – this is known as the ‘after birth’. Sometimes you will be unaware of what is happening to your placenta, as you’ll be caught up in the excitement of having successfully had your baby; on other occasions, you may be more aware of it. Either way, after your baby has been born, some extra contractions should occur that will push the placenta out of your body. Letting your baby breastfeed soon after birth can help encourage the contractions to start, as the pituitary gland in the body will naturally release oxytocin. If the contractions don’t start of their own accord – and waiting for them and doing the pushing yourself can sometimes result in a loss of blood - then your midwife may suggest that you have a form of medicine called oxytocic, that will help stimulate the contractions. The medicine is injected into your thigh, or given intravenously in a vein, as soon as your baby is born. As well as making the delivery of the placenta quick and easy, it can also help reduce the risk of heavy bleeding. If your baby is born by caesarean section, then the placenta will be delivered this way as well. The process of delivering the placenta usually takes between 10 and 20 minutes, but in some cases it can last up to one hour after birth. In most instances, the placenta is taken away by medical staff and disposed off. In some cultures, however, the placenta is cooked and eaten, as it’s believed to be highly nutritious. What If the Placenta Doesn’t Come Out? Sometimes problems can occur with the placenta at birth, particularly if it’s not all properly removed. 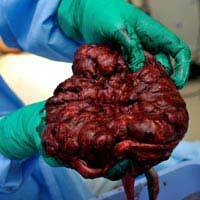 This is known as retained placenta and refers to when all or part of the placenta remains in the uterus. If there are signs that your placenta is retained, you haven’t delivered the placenta within one hour of giving birth or 30 minutes after having had an oxytocic injection, then you will be treated for a retained placenta. Depending on your individual circumstances, you may be given either a local or general anaesthetic, often through a spinal or epidural, and the placenta will be removed by your midwife or other medical staff.